Genetic engineering offers an amazing variety of possibilities, from treating diseases to creating stronger crops. Even though there are several possibilities, there are several issues because the possibilities of success also include several failures. To determine whether the failures are worth it or not is our ethical code and moral code. Genetic engineering can be good and/or bad for the animals, so deciding whether we should conduct these experiment or not is difficult to decide. Part of the public is concerned that genetically engineered animals or plants may pose a threat to human beings, specifically human health. Humans are more worried about the implications that these GE animals or plants could have on the plants or animals themselves. Animals also have rights and genetic engineering appear to violate those animal rights. Genetic engineering violates these rights because humans treat the animals as nothing more than human property. Genetic engineering can benefit animals in many ways for example, improving resistance to disease and breeding to remove features that cause injuries (cattle without horns). But it can also be detrimental for animals, so what benefits breeders can be bad for animals. For example pigs are being bred extremely fast and some are being bred too fast for their hearts, and some chickens grow too fast for their legs. "Genetically engineered animals should be no worse off than the parent stock would be if they were not so engineered," said by Bernard Rollin. This was suggested to be a suitable rule to regulate genetic engineering. Transgenic animals are animals that are bred for research and are deliberately bred with genetic defects. These defects consist of cancer, heart diseases and respiratory diseases. This can cause a bad quality of life for the transgenic animals. Some religious views of transgenic animals are that God made the animals and tampering with them is sinful. They believe that manipulating DNA is like manipulating "life itself," because we are trying to do what God does. But some other religions are in favour of transgenic animals, some believe that because humans are on the top of the food chain so we have the right to tamper with them. 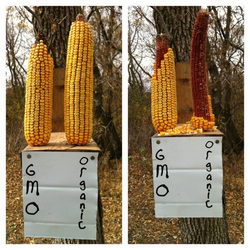 The question that many people are pandering is are GMOs better than organic grown? The image in the top left was an experiment conducted by farmers, they put out two cobs of corn, one organic and one that is a GMO. After a given period of time they checked back and found that wildlife prefers the organic cob. As mentioned before in previous pages a large percentage of the corn, soybeans and cotton grown is a GMO, so wouldn't that mean GMO crops are better because more people buy them therefore more is grown? GMOs are cheaper to grow and maintain, and makes it easier to feed billions of people. Organic are more expensive, more tedious and are more unstable to grow. In some cases GMOs offer more nutritious food than organic, for example rice with vitamin A.